By looking at your dress at the present time, the character can be evaluated by getting to know about your personality. Nowadays, what religion do you belong to, its knowledge also gets noticed by your dress? Many such examples can be given such that if a person is wearing a white kurta and wearing a white hat on his head then it is known to be his leader or a social worker. Apart from this, if a person is wearing decent clothes such as coat, pants, then it can be estimated that he is a big officer or a person who works at a higher position in any area, Therefore, Royal Ranisa is the best choice, you can easily choose the Poshak for beendani at a reasonable rate. In this way, we can say that the dress you choose for a special occasion should be good and appropriate according to the occasion. Apart from this, avoid wearing rude and poorly dressed clothes. It is not that clothes only show your personality, but it is very important to synergize ideas also. Still, we must try such a thing that we do not have to face embarrassment due to clothing that’s why Royal Ranisa best option to you choose the Best Poshak for beendani. Your Dressing Sense also decides your success to a great extent. However, if you want to become a well-established and cultured person in society, you should improve your dressing senses. Royal Ranisa is one of the best rajputi poshak stores who provide the Poshak for Beendani in many different colors and pattern. You can easily choose the Rajputi Poshak at your budget. We have a huge collection of Rajputi Dresses in Jaipur at an affordable price. Traditional attire of Rajasthan and a symbol of royalty, popularly known as Rajputi Poshak of Rajasthan. Exclusively crafted for wedding looks more elegant and graceful on women. Covers the whole body and add extra grace in your beauty. Gives you attractive look at weddings, occasion, and parties. The Bridal Rajputi poshak given the perfect finish of Rajasthan comes with kurti, kanchali, odhani, and Lehanga in Red color. Designed with Golden Color Embroidery thread work. Comes in georgette fabric highly light weighted and comfortable to wear in weddings and occasions. Royal Ranisa is one of the immeasurables stop who provides the handicraft work on Rajputi poshak. 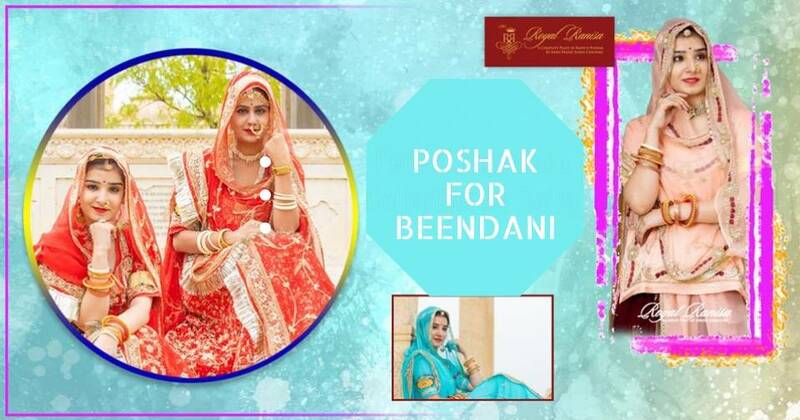 If you want to purchase a Rajputi Poshak for Beendani you can easily pick up because at royal ranisa is the best destination for Rajputi dress. 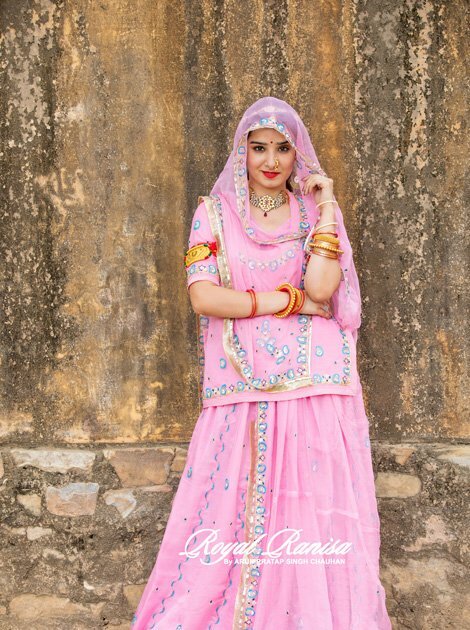 When you move around wearing the “Rajputi Poshak” you are nimbly isolated from whatever is left of the general population. We have a different type of work such as Gotta Patti poshak, Kundan poshak, Zari poshak, Zardosi poshak. 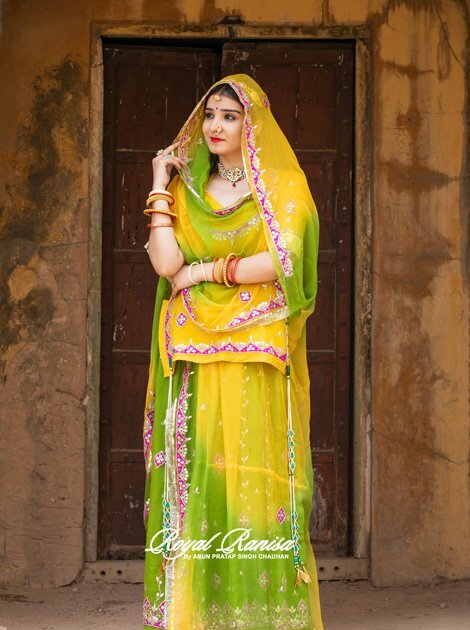 Rajasthani Rajputi Poshak is one of the famous Rajasthani Dresses that bring out the culture and heritage of Rajasthan. Keeping in mind of royal heritage and their culture. Royal Ranisa is now offering you Rajasthani traditional Poshak. Multi-color Rajputi Poshak make it more beautiful and unique and it has Beautiful golden embroidery work with Peacock design and makes it more attractive in the crowd. Royal Ranisa is one of the best online stores who provide the Poshak for Beendani in many different colors and pattern. You can easily choose the Rajputi Poshak at your budget. We have a huge collection of Rajputi Dresses in Jaipur at an affordable price.